Well I’ve been a bit quiet of late I know – I’m back in the UK for a little bit and have been manically doing up a property that I’m hoping to rent out so it hasn’t left much time for anything else! 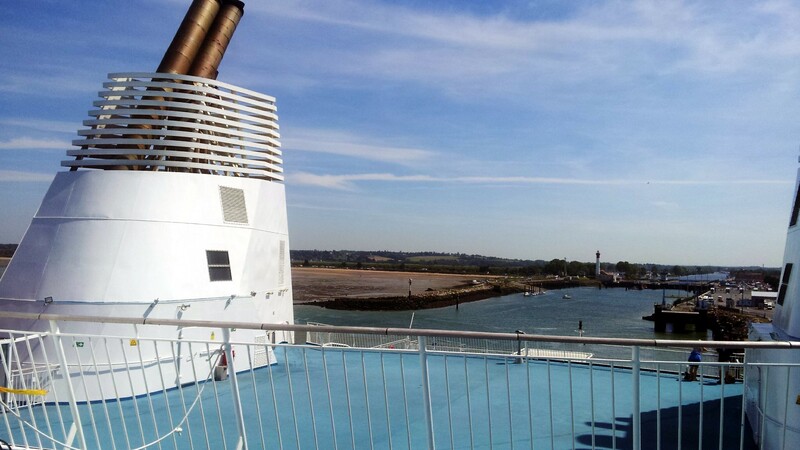 We drove back to the UK a week or two back. Why drive I hear you ask? Because I have to get the car MOT’d back in the UK so that I can get it taxed and insured. It’s an expensive undertaking when you take into account petrol, road tax, hotels and eating out (or buying food which immediately melts, whatever it is, in the heat of the car). Having calculated it and I think I could have gone to the Maldives instead by the time I drive back to Italy too! Having said that, to buy a car last year was too stressful and potentially too expensive because I didn’t have a “residenza” (Residency. In fact, I’m still not entirely sure I have it. I would have liked a medal as proof). So I think I did the right thing sticking with a UK car. But I’m going to dedicate the next few months to trying to resolve the car buying/insuring in Italy issue as I’m going to need a four-wheel drive to get to and from my new house in the winter. Anyway, let me tell you about the roadtrip! The roadtrip prep commenced a couple of weeks ago when the passenger window slid down into the car door. It did this 2 days before the last roadtrip too. The car has a sixth sense. Without any time to fix it, the first part of the roadtrip was characterised by whoever was passenger having to hold the window in place. The second half was considerably better following a sticky tape mission. This at least was slightly less embarrassing when it came to paying the road tolls – at least there was an obvious excuse for opening the door and not the window like normal people. Despite my misgivings about the cost and the sauna like temperatures resulting from the lack of opening capability for the passenger window, it was good nonetheless. 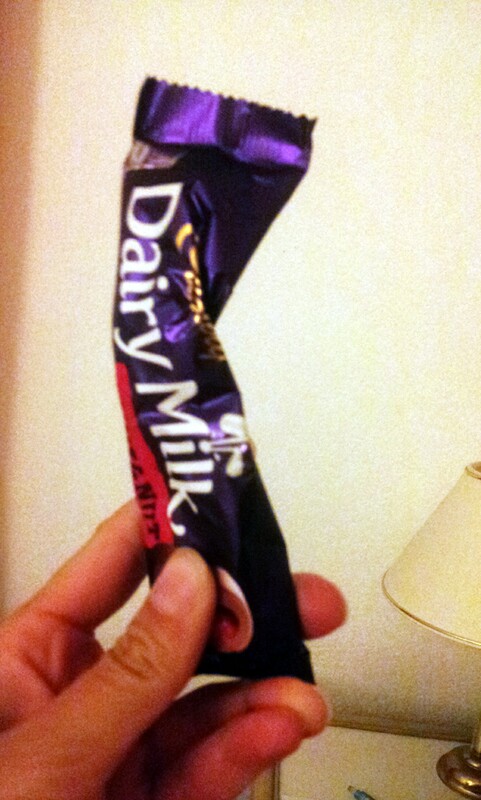 Melted dairy milk bar. The heat was overpowering but I must say, we discovered something AMAZING. What you do is buy a bag of Maltesers, leave it in a searing hot car for 3 days, put in a hotel minibar fridge and an hour later – voila, the best chocolate bar of all time. Genoa: We were actually outside of Genoa really so didn’t get a good feel for the main town. In fact, all we got a good feel for was the commercial centre. I didn’t even take any photos. Poor blogging effort I know. 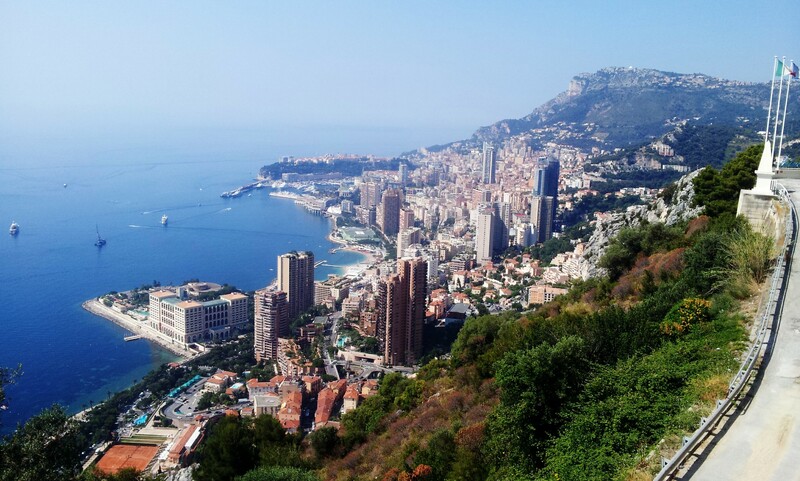 Monaco: Wow! Very impressive sky-line and water. I was upset I didn’t bring my swimming costume. I’m not into the F1 particularly but it was interesting to see the road/race-track. I can imagine that would be good to watch (for 5 minutes). Avignon: Historic town in France with a very grand cathedral with holes in the walls to shoot your enemies with arrows (in a churchly manner of course) and had some nice piazzas or whatever they’re called in France! It’s definitely worth a visit. 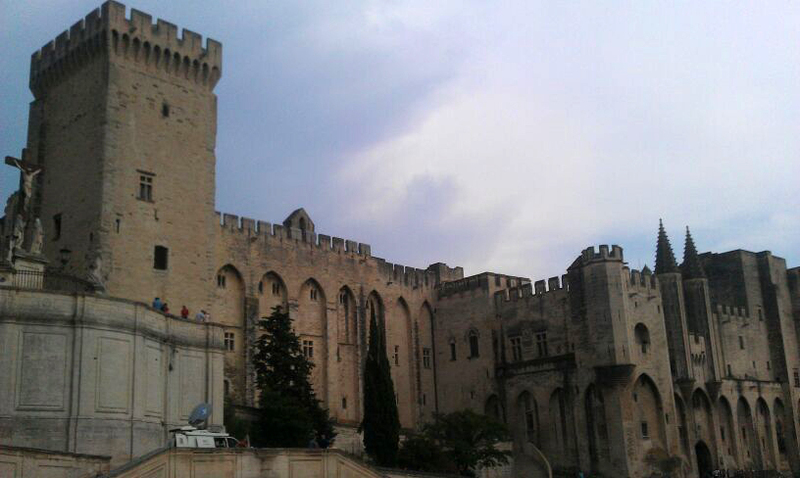 Nimes: We thought that it would be too expensive to stay around Avignon so I randomly selected a nearby town, Nimes, to stay in. 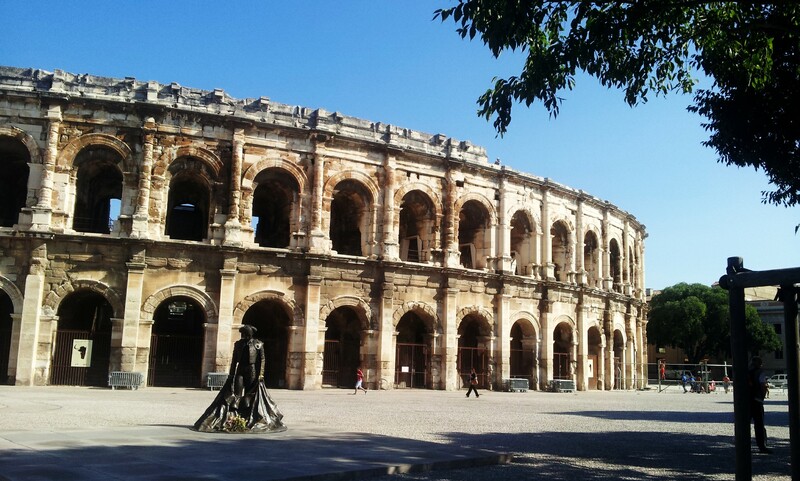 Alas, Nimes had the most expensive hotel of the entire trip and thieves in the car park to boot! Two poor people had their cars broken into overnight. Little did the thieves know all they needed to do was to tap my passenger window to gain access. To think – they could have swiped my Malteser bar! 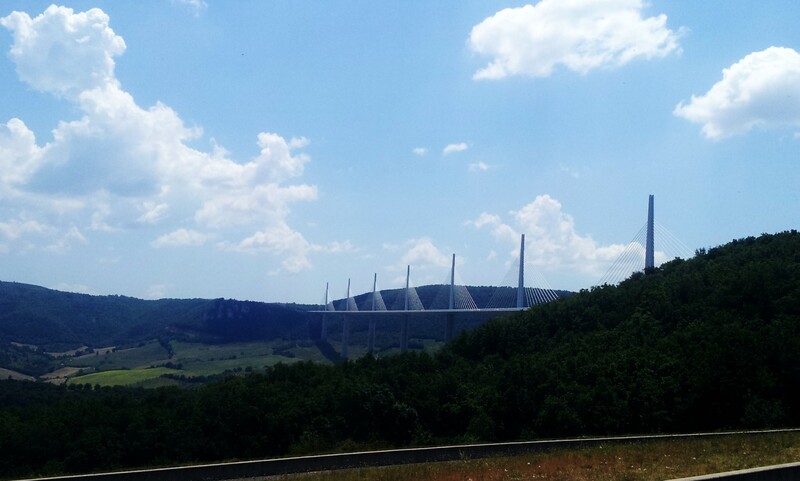 Between Nimes and the Middle of Nowhere Near Limoges where we were staying, there was the Millau Bridge, designed by Norman Foster. A very impressive bridge indeed – I recommend a visit! Middle of Nowhere Near Limoges: I booked a B&B in the middle of nowhere in Limoges. No matter what setting I put in my Sat Nav, if there is a small one lane road through the countryside, it will insist we take that road rather than the much more direct motorway. So instead of the 4.30 hours it was supposed to take, I think it took about 8. And then we didn’t have an en-suite. I should never be responsible for booking accommodation. 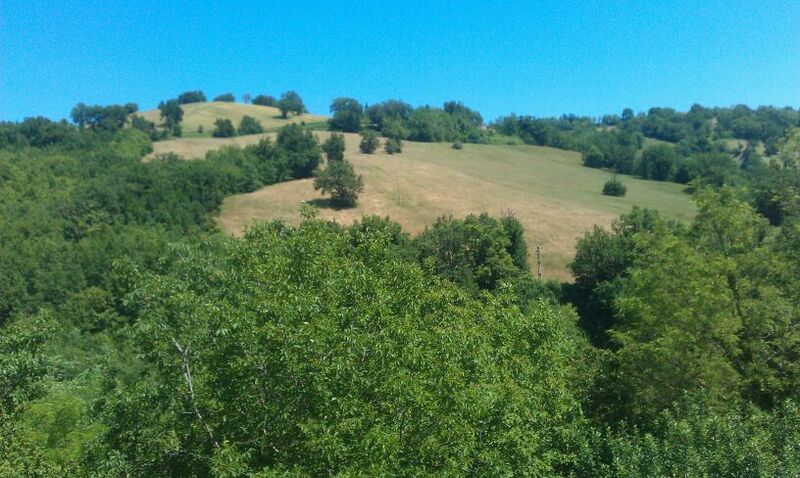 Gorgeous countryside though. Somewhere Near Le Mans: I knew Le Mans sounded familiar. It turns out it’s where they have an endurance race around a track for 24 hours. It was the same weekend we were there so very good timing. 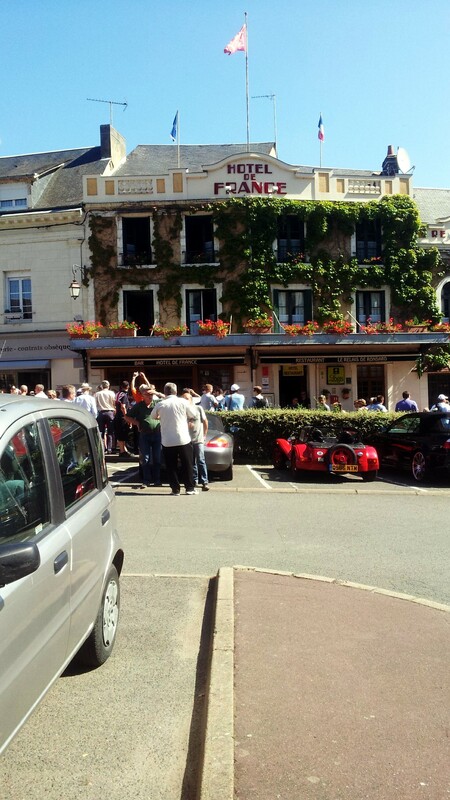 We’d booked a lovely random hotel – Hotel De France, in an area not even particularly near Le Mans and it became apparent that it was the hotel where the drivers/owners/other famous people stay (I wasn’t responsible for booking that one). The Nanmobile, with its sticky-taped-up window fitted in beautifully with the other cars in the car park (Lamborghinis / Ferraris). This is the hotel. You can see that outside the hotel there’s a very flash car which everyone is admiring. In the car park are other flash cars. In the corner of the photo is my sticky taped Fiat Panda. I’m a bit upset that it didn’t draw the same crowd that the other cars seemed to. Carist! Pfft. Caen: And then we finally got to Caen for an hour or two before the Ferry left. 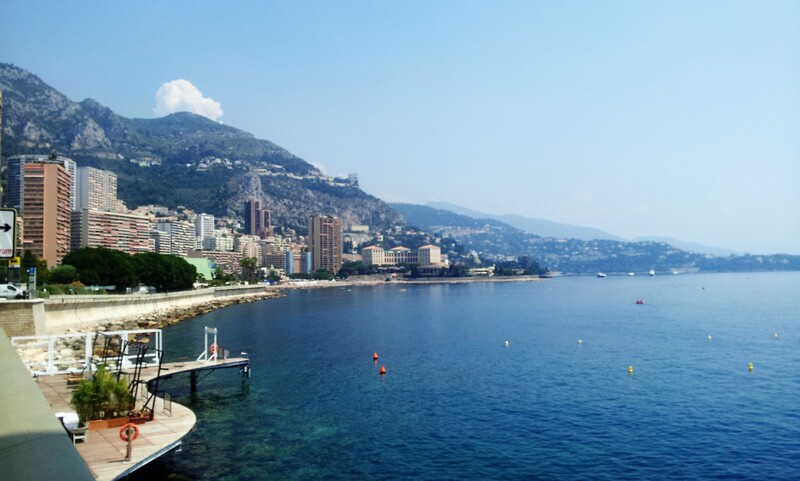 What was most noticeable about the trip was the almost immediate difference between driving in France and driving in Italy! The Italians all drive in the middle or the fast lane. If they see that you’ve left over a cars length of space between yourself and the car in front, they’ll do a risky overtaking manoeuvre to fill that spot, and give you a look / hand gestures for being too slow (and then they’ll drive at exactly the same speed just in front of you and seemingly attached to the bumper of the car in front). Italians don’t realise that the “slow” lane is for driving in when you’re not overtaking. I on the other hand will always drive in that lane unless overtaking. And not wanting to undertake, if I want to overtake one of the Middle Lane Drivers, I’ll then have to go across two lanes to overtake in the fast lane before going back across two lanes to where they were supposed to be driving in the first place. In Italy – they don’t get the hint. In France, not only do the majority all drive in the correct lane to start with but if you do the above “training manoeuvre” with them then they’ll soon get the hint and move to the slow lane. I wonder why the driving is so different in Italy to other places?! The house business in Italy is coming along really quickly! I’ve transferred my deposit to the owner and signed the first contract (Compromesso). There’s no going back now (or not without a significant cost). Completion is set for 30th July. The whole thing just feels a bit odd though – the house plans still do not represent the house we’re buying. At the moment we’re still buying the neighbour’s property according to these plans and there is still a rustic building represented which doesn’t exist. My solicitor ensures me that because of what she thinks is a comforting line in the contract: “the owner will ensure the plans represent the property when it comes to the final contract”, all is ok. So whether I’ll get a rustic building or whether the plans will be updated, and whether I’ll be getting the neighbours property or not – who knows?! In response to my question “erm, the plans here show that the cantina is split into 3 completely separate bits – not that it’s open plan like it actually is – can we change that?” was met with “if you want, we can get the owner to stack some breeze blocks in these doorways”. Well yes, that’s EXACTLY what I was after. Loosely placed breeze blocks. Much better than up-to-date and accurate plans. The whole process at the moment seems odd – and I’m half expecting the owner to run off with my money. Cross your fingers please everyone! Right, that’s it for today. Hope you’re all having good weeks. Apologies, The Saga of the Impounded Car and New House Excitement! Well this week I bring you a full gamut of emotions covering the excitement of house buying, the sheer glee of finishing teaching and the blood boiling frustrating of having your car stolen by the authorities. But firstly an apology! Firstly, an apology for anyone that I may have upset on the blog! WordPress informs me that my 2 year anniversary of MovetoItaly was only a week or two back. It’s been a positive pleasure writing it – it’s the only “diary” that I’ve ever been able to keep up and I never want to leave it for too long without writing an update. It’s become a bit of an addiction but a good one! But just like a diary, i probably don’t censor it as much as I should! So, I vent and whinge, I moan about school children, I post up pictures of “unique” bedroom lights etc. Alas, sometimes, the people that are involved in my whinging get wind of the blog (usually because I’ve been stupid and told them). Sometimes, I remember and quickly back-edit a post, sometimes I take down the offending item but more often I completely forget to take any remedial action at all. And the most difficult thing is – how do you apologise for potentially hurting the feelings of someone that may not have seen the offending mockery in the first place?! Apology 1: Sue: “Hey – did you er, read my blog post? You know, the one where I called your students little nightmares from hell?/ where I slagged off your furniture? / where I dubbed you ‘The Cheek Stroker’ because you won’t leave mine alone? Oh, you didn’t? Well, er, that’s fine, forget it, really”. Apology 2: Sue: “Hey – did you er, read my blog?”. Innocent Victim (IV): “No, I’m sorry, I really must do that – what’s the address again?”. So, I’ve decided to go down the following route: If you’ve ever read something insensitive about yourself, your students, your bedroom light or your penchant for stroking my cheeks, I apologise and am genuinely sorry. Please feel free to confront me so I can apologise in a cowardly manner. Yesterday my car was taken. Yesterday morning, rather than my car being outside, there was a market. I like markets but on this occasion, I would have preferred my car. So, I wandered around the market in despair asking people how I could get my car back (it’s not as though the thief could leave a note) and the only suggestion was “speak to the Vigili” (Vigili means watchers. Ha, if only they’d just WATCHED my car), who don’t actually have a phone number or an address that can be located through regular means on the internet. I spotted two authoritative looking figures who told me I should go to a building up the road which turned out to be where the Polizia are. I arrived at the Polizia who had a sign outside saying they were on strike and to come back another day. My laughs were heard by a nice policeman that was in the building who came out to see who was having an hysterical breakdown outside. I had to pay a very specific 29.70 euros to them to give me a green piece of paper – taking people’s cars is a time consuming administrative business. There would be a lot more to pay at the con artist’s car pound to cover their strenuous efforts. Bless their cotton socks. After continuous attempts by the nice policeman to phone the thieves car pound, he learnt that they were on lunch now from whatever time in the morning it was until 4pm so I needed to wait until then. The nice policeman then asked me if I knew where the crook car pound was. “No” I said. “It’s a long way” he said. “Great” I replied. “Do you have a car?” he asked. “YOOOOOOUUUUUU HAVE MY CAR”. Hearing a trace of hysteria return, he quickly asked his boss to give me a lift to the shysters car pound this afternoon as he was not going to be there. The slightly less friendly policeman responded after some cajoling with a “s’pose, if I have to”. At 3.45 I phoned the pilferers car pound to confirm that they were actually going to be open. “Yeah, you need to come immediately because I’m going out”. “Right. 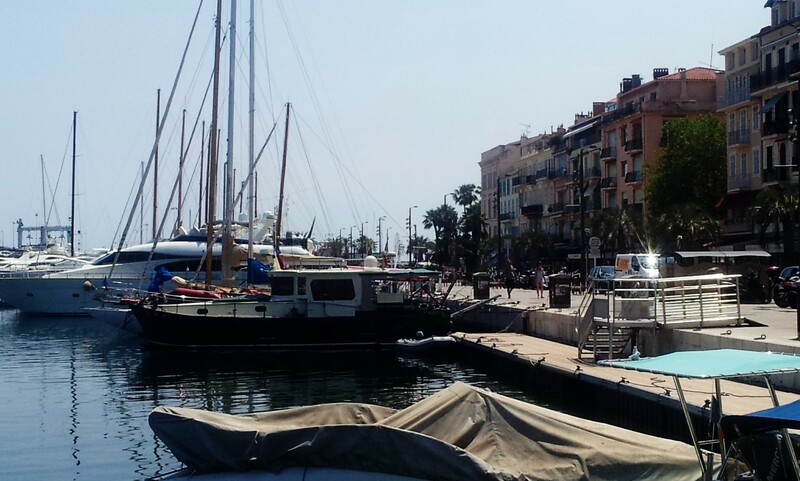 I’m actually in Falconara – I don’t know how to come immediately since you have my car and all but I’ll go immediately to the less friendly policeman and get a lift straight away”. Off I ran up the hill to the Polizia. The new shift of staff were really very friendly, lovely in fact, and spent a long time reassuring me that they would help me get my car back. So long assuring me that they would help me get my car back that the time for helping me get my car back came and went. I expressed my concern that far from being open at 4pm, they were now closed. They dismissed that notion with a wave of their hand and phoned the swindlers car pound who confirmed that they had now gone but would be back “at some point”. 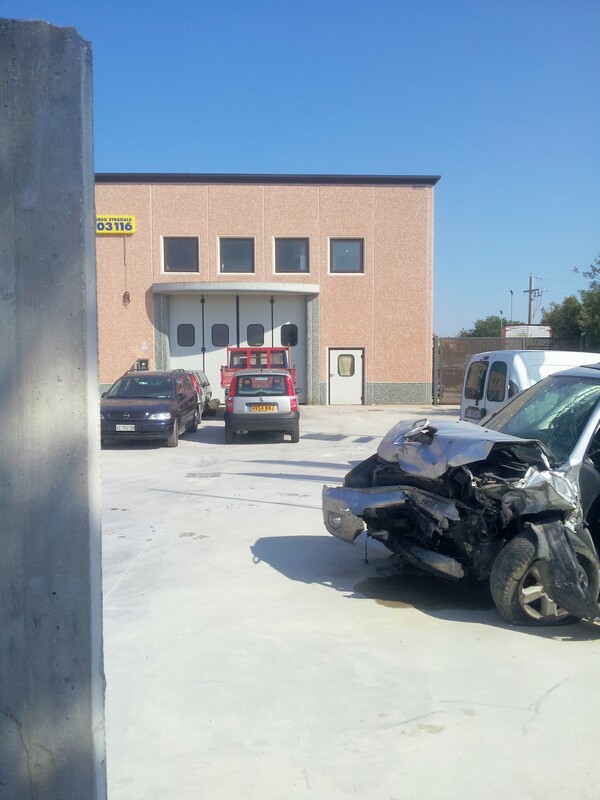 The Polizia used all their contacts and confirmed that someone would be there in 40 minutes. Some three hours later, waiting in the hot sun without water / snacks / firearms and staring at my car behind some annoyingly sturdy looking metal gates, the cheats car pound men arrived. I obviously need to remunerate them for their hard work so I gave them 96 euros. I just hope that it’s enough to cover the stress of stealing having to haul away my car when they’ve had such a busy day out of the office at the beach recovering other vehicles. I had considered jumping over the gates and trying to drive out but I was put off by this car on the right which had obviously tried something similar. Anyway, I’ve totally learnt my lesson. I should be checking daily a sign a few hundred meters up the road to see if my car will be stolen if I park it next to the flat, on the road that I have already paid 50 euros for the privilege of parking on for 3 months. Apart from that it’s actually been a good week! I went to see the house in San Ginesio again (this will change – it’s sort of between San Ginesio and Sarnano – it’s less that I’m fickly changing houses and more that I’m being inconsistent!) and confirmed that I still want to buy it. 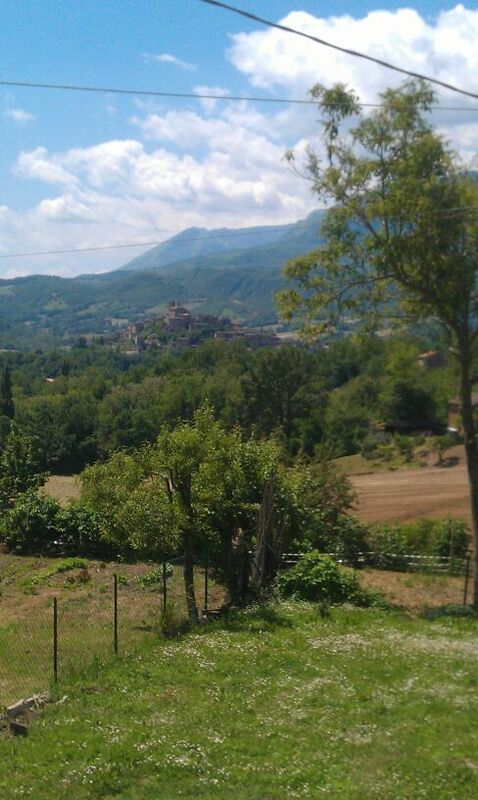 And these are the Sibilini Mountains in the distance and you can just about make out the town of Sarnano too. I wont lie, there are confusing bits that need sorting on the paperwork. In particular, there are rustic buildings where there aren’t rustic buildings, there are storerooms where there aren’t storerooms and the floor plans look like a child could have done them. The first official step is to get a “Compromesso” (interestingly translated as Compromise but is essentially an initial promise between the buyer and seller, after which there are financial penalties to pay if either party pulls out). But there’s so much opportunity and it costs hardly anything. So hoping to do some decent floor plans and put together some ideas about how it could look. It’s so exciting! It feels like my first proper home! Move date should be mid August hopefully. 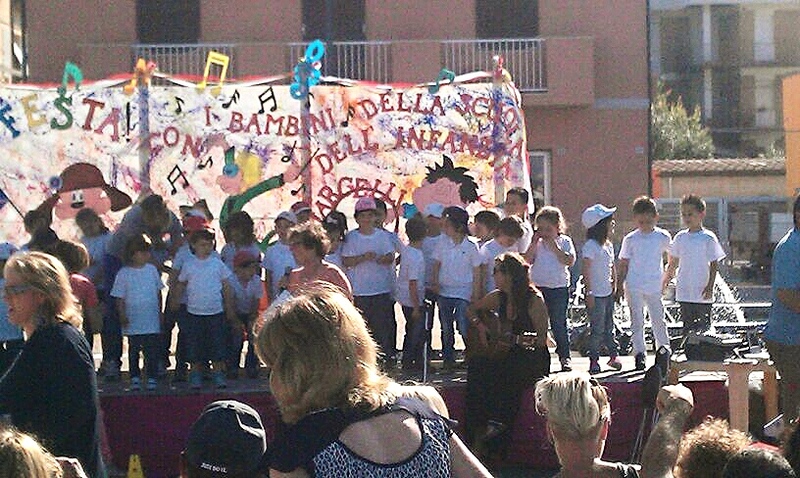 I’m sure you can believe how devastated I am to have finished teaching at the schools this week 🙂 The finale was a disastrous show with the infants who forgot every single thing that we’d done in the last year in front of their parents and passers by on the beach front in Marcelli. None-the-less it marked the end of an interesting year teaching school kids English so I was happy and I got a lovely bunch of flowers to say thank you. Ok that’s me done for this week.